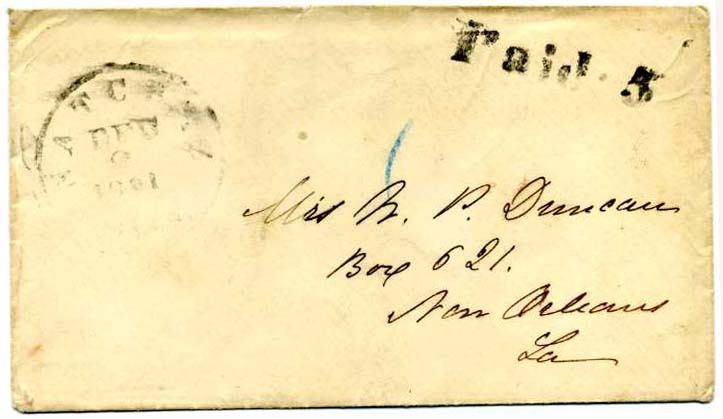 NATCHEZ / Miss // DEC / 2 / 1861 cds with boldly struck matching handstamped Paid 5 on small commercially made cover to Mrs N. P. Duncan, Box 621, New Orleans, La. ; small flap faults, Scarce. $325. CARROLLTON / Miss // NOV / 13 light cds with manuscript Paid 5 on cover to Messrs Carroll Hoy & Co., N.O., La. 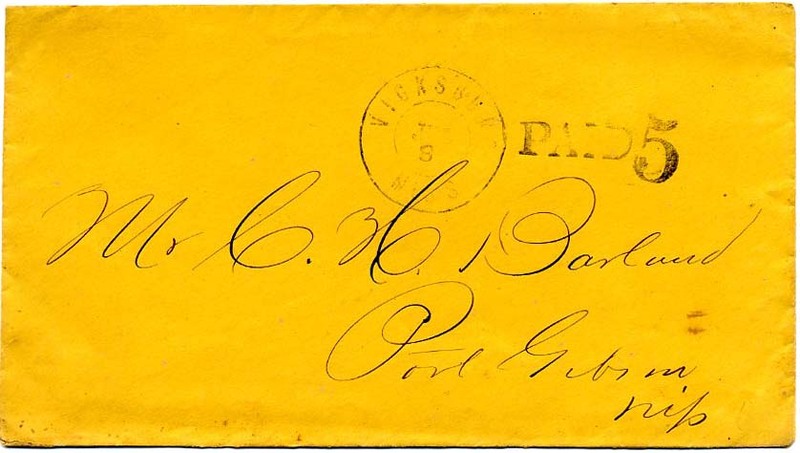 with characteristic pin holes of this correspondence, CCV $150. $130. CANTON / Mi. 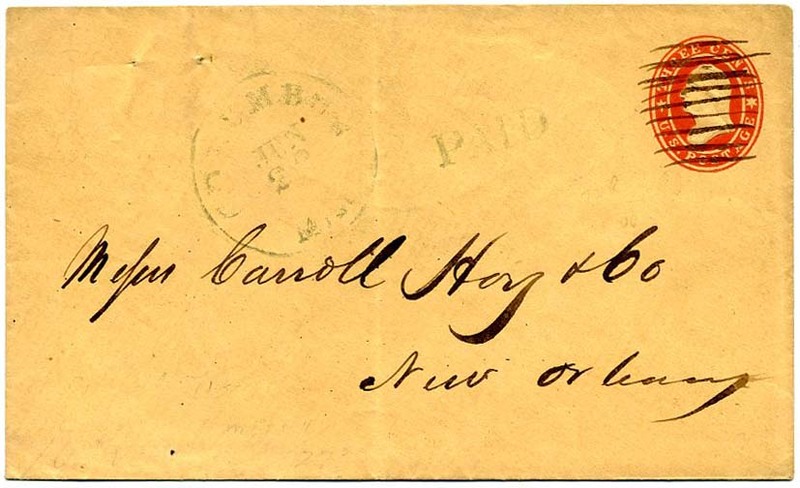 // JUL / 17  with matching PAID 5 (CSA Catalog type C) on stampless cover to Carrol Hoy & Co, New Orleans with characteristic pin holes of this correspondence, back flap opening tears, Nice strikes. CCV $500. $450. “Due” in ms with handstamped “10” field markings on soldier’s cover addressed to Mrs. R. M. Gill, Okolona, Miss. / (Via) Mobile & Ohio R.R.”; mandated endorsement “From J .E. Nabers, P.S. C(o.) H, 41st Miss. 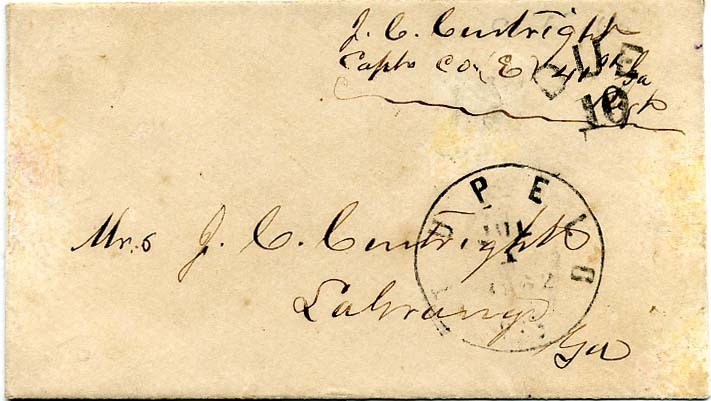 Regiment” but no postmark of origin. Routing endorsement at lower left “Mobile & Ohio R.R.” James E. Nabors (also Nabers or Neighbors) was born 1839 and didn't survive the war but nothing else found on his death. Robert M. Gill, age 27, was also of the 41st Miss Infantry, enlisted as a Lieut. April 1862. $150. 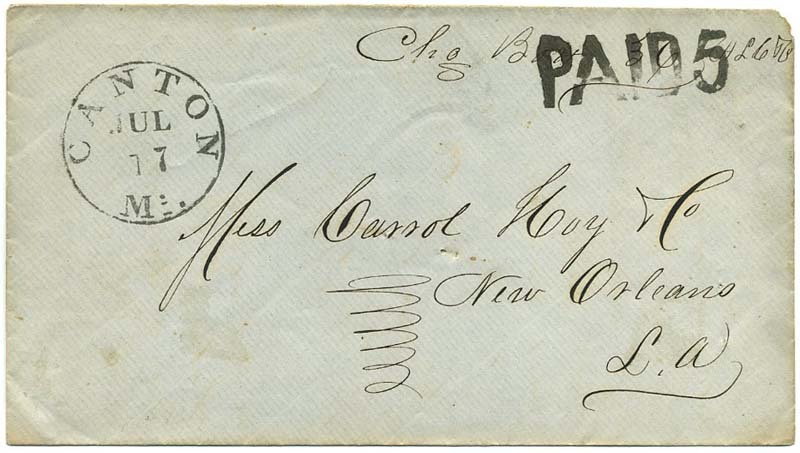 VICKSBURG / MISS double circle datestamp with matching 2-line handstamped DUE 10, CSA Catalog type D,on cover to Mrs. W. A. Chunn, Manassas, Georgia endorsed from “W. A. Chunn, 40th Regt Ga. Vols.” $250. William Augustus Chunn enlisted in Company I, 1st Regiment, 1st Brigade of the Georgia State Troops on October 5, 1861 and was elected 2nd Lieutenant. Much more information on the linked page. 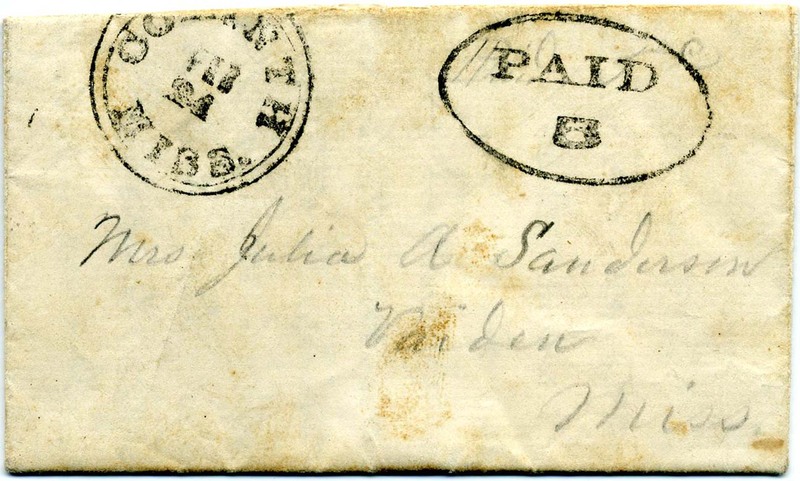 TUPELO / MISS // JUL / 1 / 1862 cds with matching DUE 10 (CSA Catalog type C with CV $300 for normal use) on soldier’s cover endorsed “J. 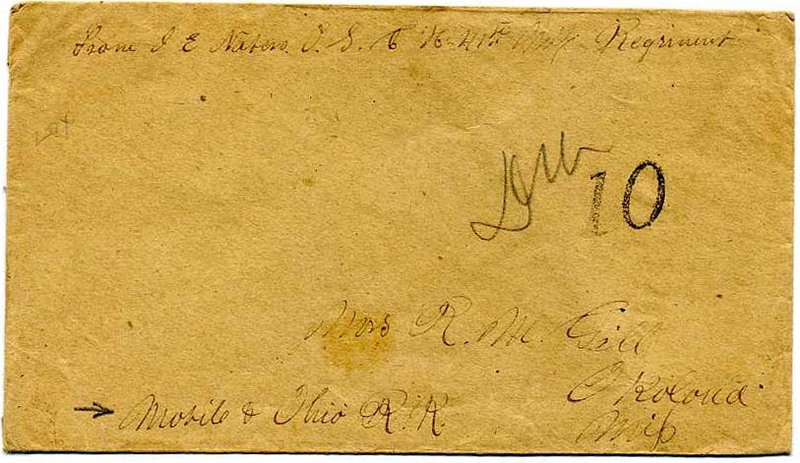 C. Curtright, Capt Co. E 40th Ga Regt”, addressed home to his wife in La Grange, Ga. FIRST DAY COVER - THE FIRST DAY OF THE UNIVERSAL 10¢ POSTAL RATE and thus a requisite for any comprehensive exhibit. Slight bit of professional cleaning. Will be the subject of a forthcoming article in La Posta. $1,500. Captain John Cornelius Curtright commanded Company E of the 41st Georgia Regiment. Much more information on the linked page. VICKSBURG / MISS double circle cancel with “[due] 10” on soldier’s cover endorsed J[ames] N. Thompson, Co (E), 1st La regment (sic) Heavy Artillery to A.W. Thompson Esq, Jefferson, So Ca. 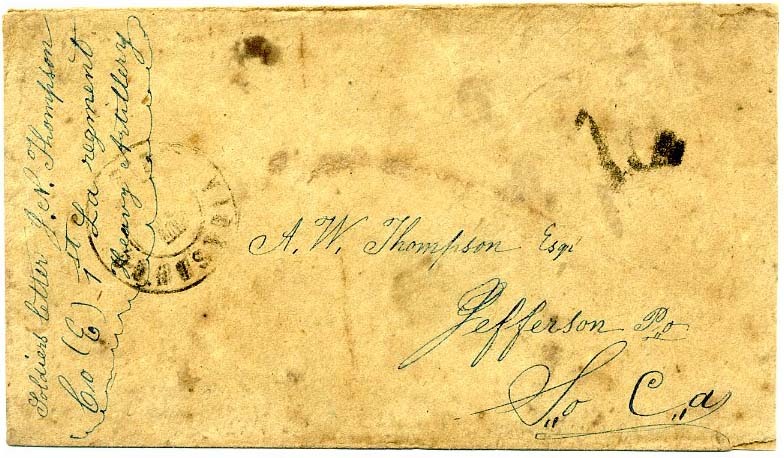 There was also an Alexander Thompson in Co. F of 1st LA Heavy Artillery but no way to assure it was the addressee (seems unlikely with the Esq after his name which could be father at home – yours to research further). $160. 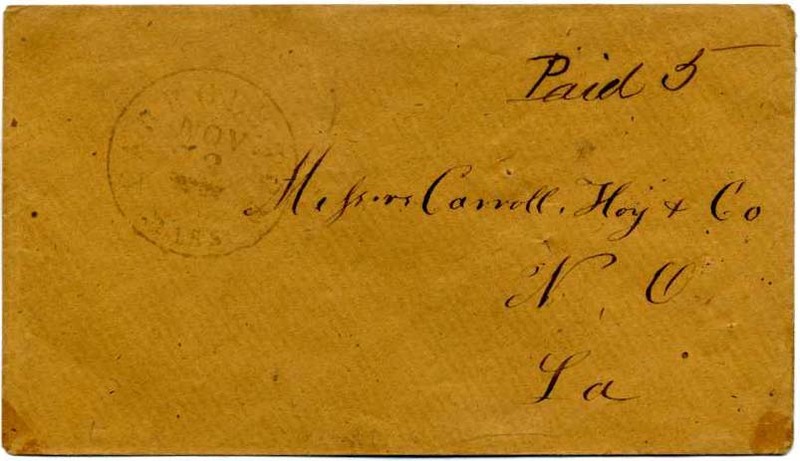 COLUMBUS / Miss // JUN / 22 with matching PAID (no rate), CSA Catalog type A, adversity use of 3¢ star-die entire (crossed out, just used the envelope) to Messrs Carroll Hoy & Co, New Orleans with usual filing pin holes and light vertical crease. $180. VICKSBURG / MISS // JUL / 5  cds with matching PAID 5 (CSA Catalog type B, CCV $250) on fresh commercially made cover to C. H. Barlund, Port Gibson, Miss, docketing on verso “Dr. 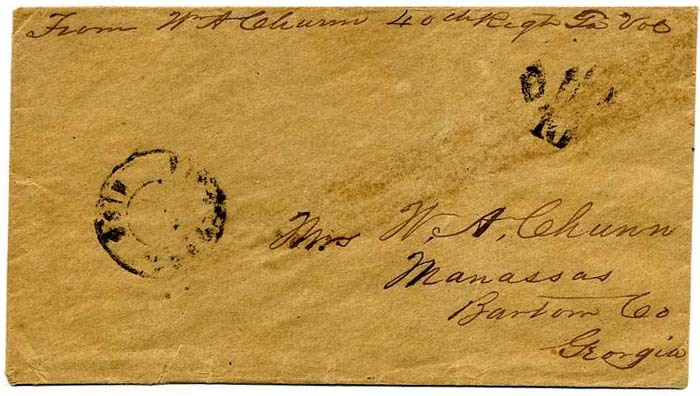 Barlund’s letter July 6, 1861.” $200. CORINTH / MISS. // FEB / 24  DOUBLE-LINE CIRCLE cancel (much scarcer than the single-line cancel), beautifully struck with matching clear bold PAID 5 in oval (CC Type C) on 3-page folded soldier’s letter in pencil, few small holes in the letter itself but not on the cover face; addressed to Julia A. Sanderson, Vaiden, Miss; the letter is simply signed “A,” who was undoubtedly A. J. Sanderson. It mentions pitching a tent outside of town and an artillery corps from New Orleans that is camped 50 paces away. Ex Boshwit. $450. 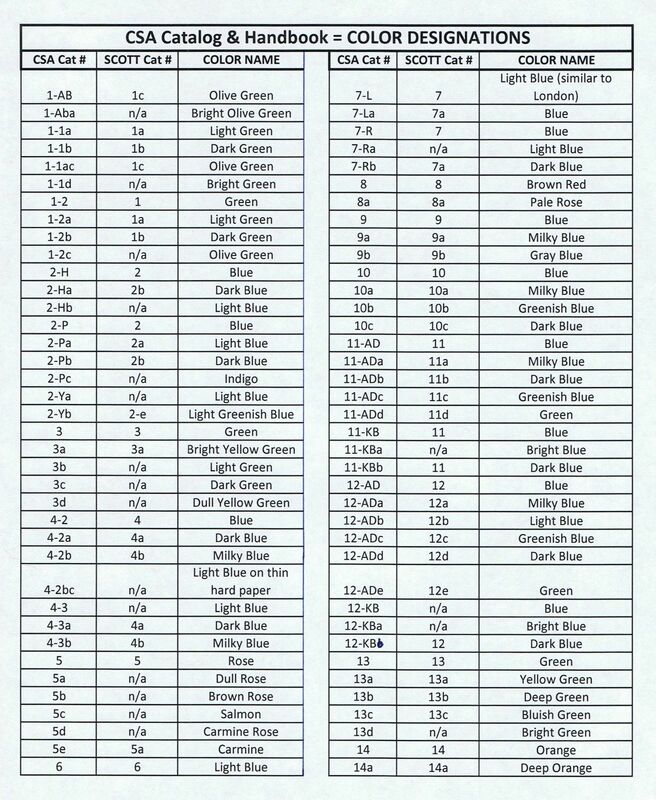 Detailed correspondent information on the linked page. CORINTH / MISS. 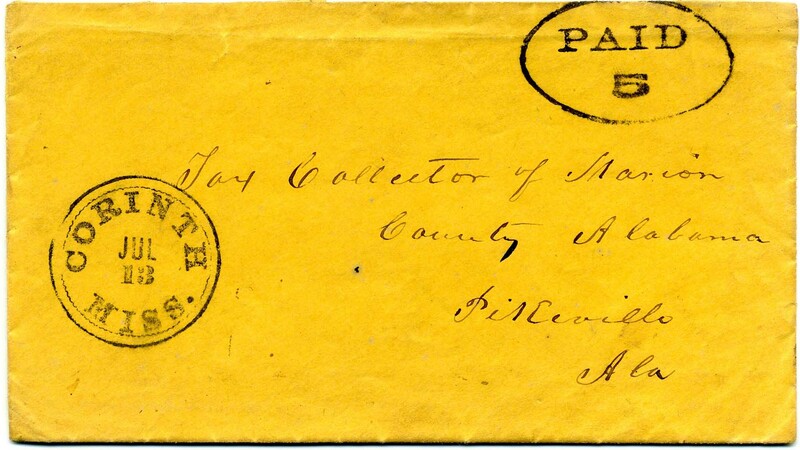 // JUL / 13  beautifully struck double rim circle datestamp with matching PAID 5 in oval (CSA Catalog Type C, CV $300) on cover to “Tax Collector of Marion County, Alabama, Pikeville, Alabama,” top back flap missing, Extremely Fine. $450.